In blender or food processor, place ingredients. Cover; blend until smooth. Pour into 8- or 9-inch square (2-quart) glass baking dish. Freeze uncovered 1 hour. When ice crystals begin to form at edges of dish, stir mixture with fork. Freeze 1 hour longer, stirring after 30 minutes. Stir well; cover. Freeze 3 to 4 hours or until frozen. To serve, let stand at room temperature about 15 minutes. Uncover; scrape and spoon granita into individual dessert dishes. Garnish with mint sprigs. 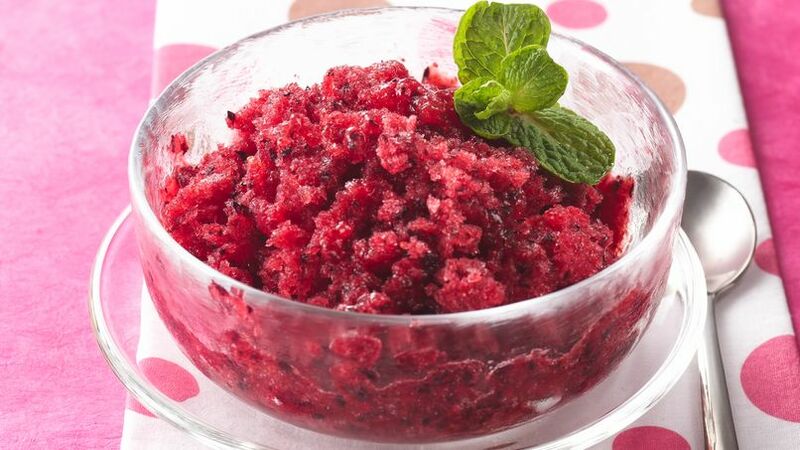 Cascadian Farm® strawberries and blueberries come together in this citrusy frozen granita - a perfect Italian dessert.